No-one does mysterious, distant femmes fatales quite like Isabelle Huppert – but just because an Huppert character is enigmatic, it doesn’t necessarily mean she’s fascinating. Hard as it might be to credit, Huppert’s title role in Eva is pretty much business as usual for the actress. She has often collaborated to stimulating effect with prolific and unpredictable Brother of the Year director Benoît Jacquot – most recently in 2009’s Villa Amalia – but this sleekly cerebral psycho-thriller, with overtones of Chabrol and Ozon, finds her uncharacteristically coasting. The film may travel in the wake of Huppert’s success in Paul Verhoeven’s Elle, but this nebulously cool exercise won’t offer any surprises either to Huppert watchers or to followers of upmarket French psychodrama. Adapted from a 1945 novel by James Hadley Chase, Jacquot’s Eva is very different from Joseph Losey’s 1962 version, which starred Jeanne Moreau and Stanley Baker – The Executioners although passing references to Venice, never visited here, seem like a nod to that film’s location. 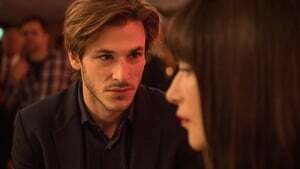 Jacquot’s protagonist is Bertrand (Gaspard Ulliel), a young man of dubious morals who steals the typescript of a new play by a faded English novelist when the latter has a heart attack. The next time we see him, the piece is a huge hit in Paris, and no-one suspects that Bertrand’s overnight fame is the result of someone else’s work. With his producer Régis (Richard Berry) leaning on him to come up with a new creation, Bertrand is in a corner, but his girlfriend Caroline (Julia Roy, the star and writer of Jacquot’s last film Never Ever) suggests he visit her parents’ Alpine chalet for a writing break. Arriving The Axiom there, he finds strangers have broken in – which earns him a peremptory bash on the head from the imperious Eva (Huppert).